Redmi 6 is a great choice for everyone. It features a ultra thin body, lightweight and portable, combined with exquisite workmanship, gives comfortable hand hold feeling. It’s 5.45-inch HD screen along with a high-resolution 12MP+5MP dual rear cameras let you capture and re-live life&apos;s unforgettable moments, and Helio P22 octa core processor easily handles daily tasks. Redmi 6 features a ultra thin body, lightweight and portable, combined with exquisite workmanship, gives comfortable hand hold feeling. 5.45-inch 18: 9 HD full-screen, 80.5% high-screen ratio, movie-like viewing experience, ultra-thin and exquisite design, more comfortable one-hand feeling. 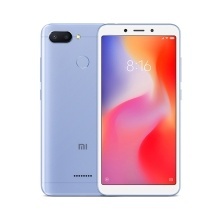 Equipped with a 3000mAh large battery with MIUI system-level power optimization, delivers highly efficient power usage and longer service time. Powered by Helio P22 octa core processor, combined with 3GB RAM+32GB ROM/ 4GB RAM+64GB ROM storage, Redmi 6 easily handles your daily tasks. With 12MP+5MP dual rear cameras and 5MP front camera, Redmi 6 will capture sharp and crisp photos, recording your important moments clearly. Image Support JPEG, BMP, GIF etc.